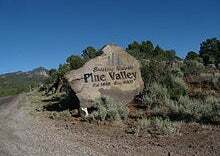 The most popular point of access to the Pine Valley Mountains is from the town of Pine Valley itself, a place popular for second-home owners. Near Pine Valley, you will find Pine Valley Reservoir, a campground and trailheads, including the beginning of Signal Peak Trail. Another access point to Pine Valley recreation is the Oak Grove Campground, approximately 8 miles north of Leeds, Utah.